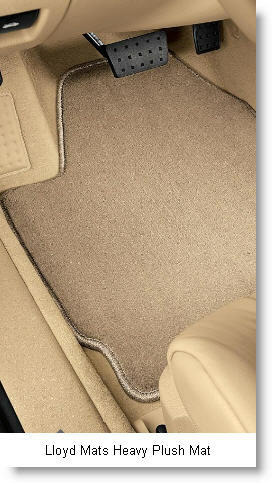 Lloyd Mats Manufactures the Luxe, Heavy Plush and Ultimat Car Floor Mats. Lloyd Mats (Lloyd) is one of the largest manufacturers of custom fit car floor mats in the USA. The company began making custom fit vehicle mats in 1978 and now has 11,000+ patterns for almost every make and model of automobile, pickup and SUV sold in the USA since the 1950's. So I bet they have a mat for your American Motors Gremlin or your Studebaker or your Chevy Biscayne or your Triumph TR6 or your BMW or … well you get the picture! Lloyd Mats makes 5 different flavors of custom fit, carpeted car floor mats; the LUXE, the ULTIMAT, the soft as silk Velourtex, the TruBerber and the Classic Loop which are all made at Lloyd Mats state of the art manufacturing facility in Northridge, California. All have multilayer construction consisting of, at a minimum, a woven polypropylene backing (the carpet yarn is attached to this backing), a heavy latex or urethane backing (for stiffness and moisture barrier), a water resistant layer, another piece of polypropylene or acrylic backing and finally a rubber nib or TractionBac skid-resistant backing to prevent mat slippage on your vehicle floor. Tip: Keep these mats in the best shape possible by using universal absorbent car mat protectors. These mat protectors also reduce the amount of moisture trapped between the vehicles carpeting and your new LloydMats car mats. Helps keep the mold and mildew smells down and slows carpet rot. 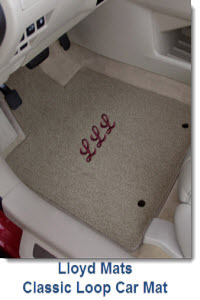 The carpeting in a LloydMat car floor mat is treated to resist stains and dirt. The mat edges are neatly bound and trimmed with a complementary colored binding material. 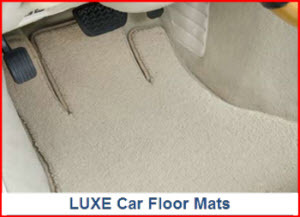 Lloyd Mats Carpeted Mats are provided with factory compatible anchors or Lloyd's own mat hook system. For the budget minded car owner Lloyd Mats imports and distributes the semi-custom fit Heavy Plush mat. Beautiful, thick, heavy carpeted mat for a very reasonable price. The LUXE Mat is Lloyd Mats flagship product. It’s made from 48 oz. continuous filament, 2 ply, nylon yarn which Lloyd says is so soft, “you’ll want to drive barefoot”. A layer of urethane supplements the multilayer backing, providing a cushy feel and improving the heat insulating and sound deadening properties of the mat. TractionBac, a natural rubber, non-slip backing prevents mat slippage and is used in conjunction with Lloyd’s own mat fastening system or your vehicles original equipment mechanical anchor posts. The ULTIMAT mat is the most popular mat in the Lloyd Mats product line. Wow! My tongue’s twisting from saying MAT so much! Anyway these car mats are made from 32 oz. continuous filament, 2 ply, nylon yarn that's been twisted together and heat set into a tuft. TractionBac, a natural rubber, non-slip backing prevents mat slippage and is used in conjunction with Lloyd’s own Post and Hook anchor mat fastening system. Of course if your vehicle already has a factory installed anchor system for your mats your Ultimat will come custom engineered to support it. The HEAVY PLUSH mat is Lloyd’s answer to the universal car floor mat. It’s a semi-custom mat, which means it is not custom cut to fit your vehicles floor pan, but is a closer fit than a universal mat. It’s made from 40 oz. polypropylene yarn which resists water and dirt. A rubber nib backing is used to prevent this mat from slipping on the vehicle’s floor. This mat may be ordered to fit most vehicle makes and models from 1990 to the current model year. All the slightly technical info and pics above don't quite do the job describing how nice these car mats from Lloyd Mats really are. You gotta read some customer reviews. For you comparison shoppers out there, I think the closest competitor to Lloyds with an equally wide selection of car mat designs is IntroTech . Between these two manufacturers you oughta be able to find at least a couple of mats that will juice up your ride and make you the most coolest member of your posse. OK, on with some more carpeted car mats from Lloyd Mats. TruBerber is Lloyd's answer to those of you who want a durable, long wearing carpet with the rich style of berber carpeting. Over 11,000 different floor patterns ensure a perfect fitting mat for your vehicle. Made from polypropylene and nylon blend, 48 oz. yarn, flecked with color, treated to be crush and stain resistant are some of the features that make this mat extra special. Matching cloth velour edging prevents the mat from unraveling. 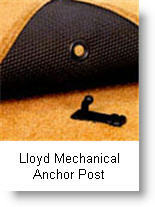 Anchor devices, either OEM or from Lloyd Mats secure your mat to the floor. With 1000+ licensed automotive trademarks, lifestyle and personalized designs you make this mat totally unique for your vehicle. Heavier and denser than the mat which comes with your vehicle from the factory, the Velourtex carpeted mat from Lloyd Mats gives you great value at a reasonable price. Manufactured from premium, extra soft, continuous filament 20 oz. nylon yarn, you'll want to take a nap on one (or two) of these mats. The Velourtex is constructed in much the same way as other premium Lloyd's Mats with the yarn sewn into a woven polypropylene mesh that is bonded upon moisture and skid resistant layers. The Classic Loop Mat is the custom fit carpeted mat you want to buy if you're concerned about your pocketbook. Built of a 20 oz. loop style polypropylene yarn this mat is extremely durable. It resists stains, chemical attack (like oil and gas from your feet) and is extremely resistant to wear and tear. The poly yarn is actually colored while the polypropylene is still in liquid form. So the color totally permeates the yarn as opposed to being a surface effect. What this means for you is that as the carpet wears the color still stays strong and bright.